It triggers one of the happiest memories of my childhood, August days spent on big blackberry picking parties with the Sheens, family friends from Mom and Dad’s Alberta days. Jack Sheen and Dad went at the bushes with clippers and ladders. The seven of us kids looped our buckets into our belts for two-handed picking. 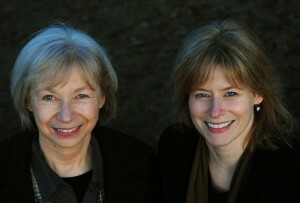 And Mom and Grace provided the picnic lunch, which always included chocolate cake, “for the men,” Mom said, but I doubt they enjoyed it any more than we did. As years went by, I kept on making jam. I’d pick enough berries for a batch or two, mash and measure them, then freeze them. When we ran out of jam, I’d pull the berries out of the freezer, and, following Mom’s lead, cook up enough for seven good sized jars. That worked well for a long time, but it doesn’t any more. We eat less added sugar, and less bread. Last year I picked raspberries and put berries for two batches in the freezer, measured and ready to go. They’re still there. I have, however, found a way to satisfy my jam making urges: the micro-batch. I made the first one last summer, after arriving on Read Island with no jam, and a peach and several apricots rapidly heading towards rot. Read Island is the one place where breakfast always includes toast, which always requires jam. I pulled out the Joy of Cooking, read through the recipes and then struck out on my own. Here’s the pattern: 2 cups of crushed fruit, 1.5 cups of sugar (much less than in a traditional batch, where the sugar is almost double the volume of the fruit) and whatever extra flavoring you might want to toss in. 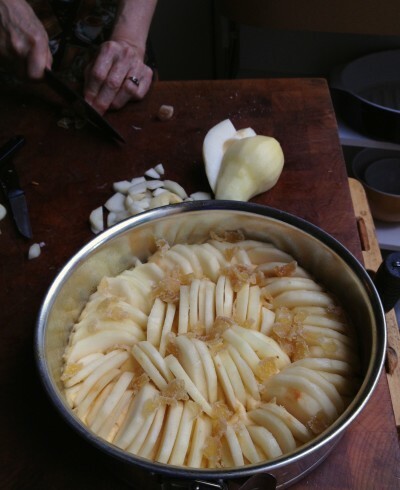 No pectin required and not much time. And because the quantities are so small, you have more freedom to play around with flavors. 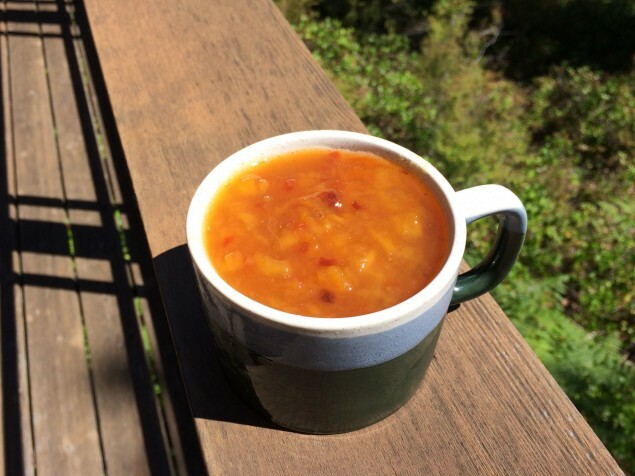 First time around I added some chopped dried apricots that I found at the back of the cupboard. My second micro-batch jam came from two cups of strawberries that were rapidly approaching their best-before date. Two tablespoons of orange liqueur improved them immensely. But the best jam of all has to be blackberry lime: straight up blackberry jam with lime juice and zest squeezed in when the cooking’s finished. If, like me, you like to re-use Bonne Maman jam jars, you’ll get one full jar with some left over. Standard 1-cup canning jars should give you two full jars. Combine berries and sugar in a two-quart saucepan. Stir over medium heat until the sugar dissolves. Raise the heat to high and bring the berries to a full rolling boil for one minute. You can skim the foam from the top if you like. Reduce the heat to a simmer and cook until the jam is as set as you would like it to be, about 20 minutes. Test for jelling by dropping a teaspoon of jam on a saucer, then tipping the saucer. If the jam moves slowly, and starts to set as it runs down the saucer, it's cooked. You can also check that you spoon leaves a track on the bottom of the pan. Remove the pan from heat, and stir in the lime juice. Pour the jam into whatever heatproof container you've chosen. 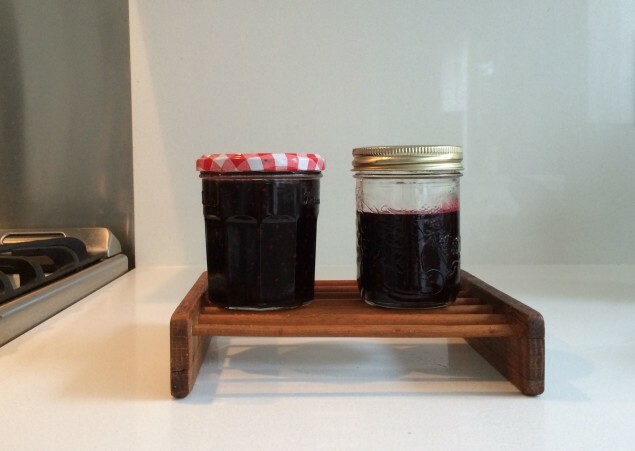 If you're using a standard jam jar, you'll have about half a cup of jam left over for another container. Makes about 2 cups jam. The last day of August. How did this month fly by so quickly? It seems only last week I was waking up, day after day, to bright sunshine that would warm up to make another spectacular day. The long, hot days in July and most of this month blurred together bike rides around the seawall, trips to Granville Island market, and Sam the (fair weather) cat only too happy to spend all day and all night outside sleeping in the garden. What better way to celebrate summer than with a dinner for friends that enlists the grill in every course, from appetizer (chicken satay) to main course (fresh halibut) to dessert? Yes, dessert. 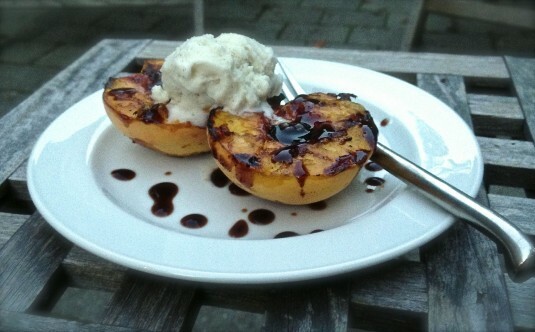 I’m talking grilled peaches…. When we were talking on Saturday, you mentioned that meditating for only a few minutes a day can help increase grey matter in your brain. I know it’s a good practice, but I’ve found it challenging to sustain it daily. Your comment got me thinking again. It also made me think that small investments in time can often yield benefits that endure. I thought of getting together with good friends, or exercising for just half an hour. Both of those make me feel better and last well beyond the actual time spent. The oven drying takes just under an hour, plus a few more hours to completely dry. Mostly it’s not active time, just a matter of being around so you can keep an eye on the fruit slices while they’re in the oven. 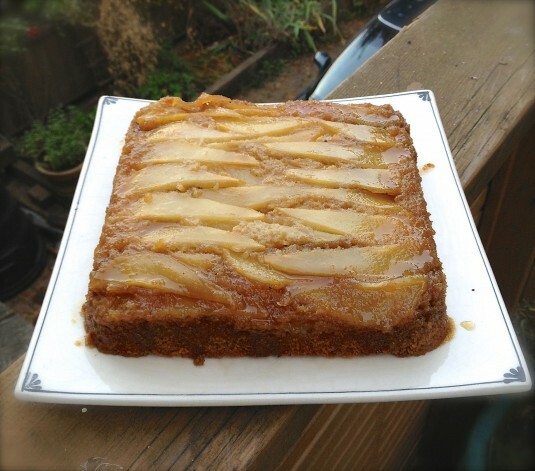 And what you get are compact slices of amped-up apple and pear, concentrated flavor in a sweet, chewy bite. Delish. They can be used a number of ways. So far I’ve tossed them on top of green salads and stirred them into hot cereal. (The cereal was particularly good.) They would jazz up a cheese plate, particularly if a cambozola or roquefort were involved. And I bet they would be heavenly dipped in some dark chocolate. Oh yes, dried pear and chocolate. Now that’s a thought I can meditate on. Use firm fruit. It’s easier to get the slices thin and produced a better (drier) result. 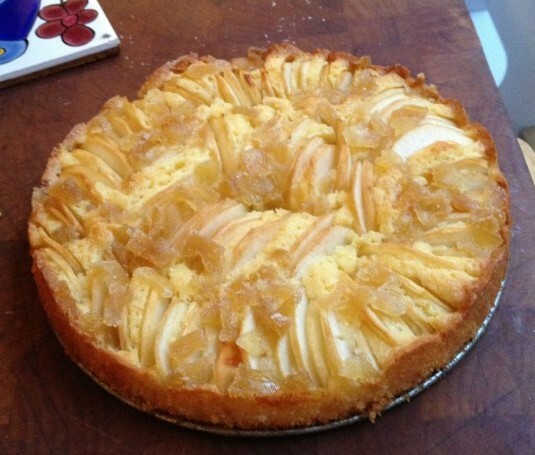 I used a Granny Smith apple and both Bartlett and Bosc pears. Unless you’re particularly seed averse, don’t bother coring the fruit. Leaving the seeds in is easier, and they look quite pretty. 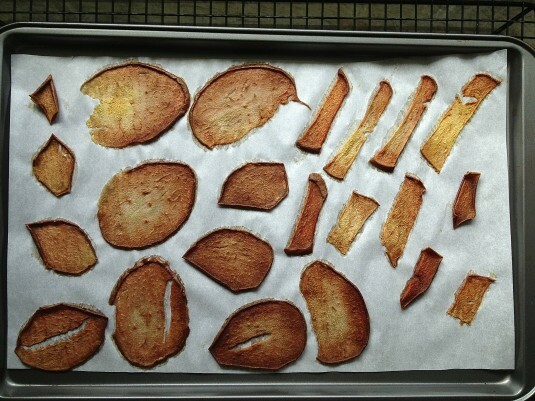 Use parchment-lined baking sheets, and place the slices directly on the parchment – no oil required. Preheat oven to 200°F. Line a large baking sheet with parchment paper. 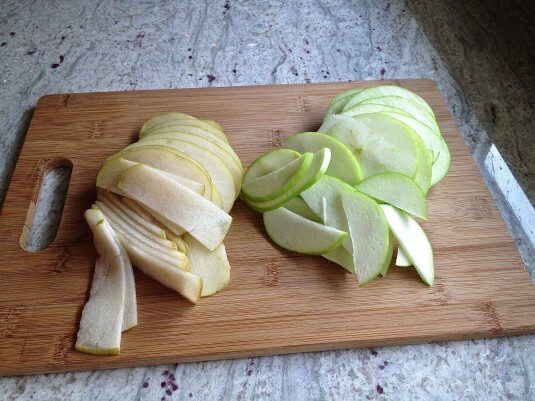 Slice the apple and pear crosswise into thin slices, about 1/8” thick. If you have a mandoline this is a good time to enlist it. If you don’t (or if it’s in storage like mine is) use a sharp chef’s knife. Place the slices evenly on the parchment-lined baking sheet and place in the oven. Let the slices dry for about 45-60 minutes. It’s a good idea to check them at the 45-minute mark, as the thinner slices will start to get toasty brown then. Remove the baking sheets from the oven and let them cool for 5-10 minutes. 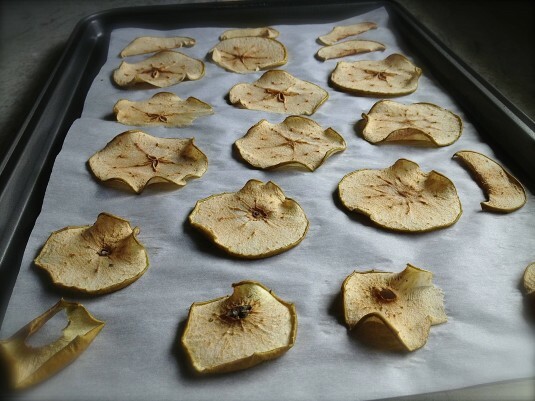 Carefully peel the slices from the parchment, and transfer to a cooling rack to finish drying. This may take a few hours. Store in an airtight container for up to a week. 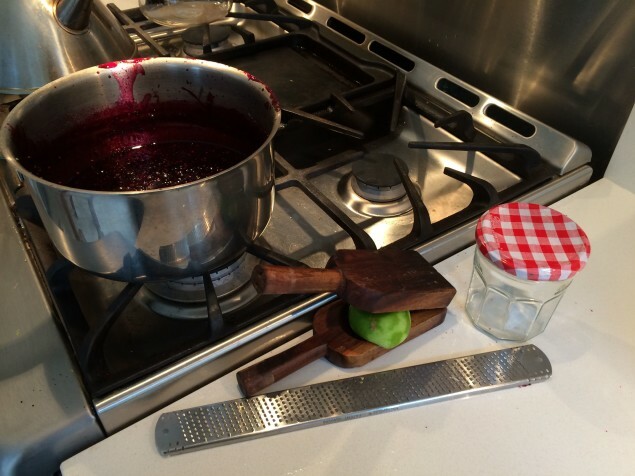 My aim was to make a good, savory blackberry sauce. One that would creatively accompany a main course like grilled fish or meat. I tell you, it’s been a windy road to get there. I think it comes down to the color. Blackberries are, well, black. Very, very dark. For dessert, this is not a problem — a dark purple sorbet or pie filling that’s inky blackish purple come off as fun, like a whimsical finish to the meal. But when you’re aiming for a savory sauce, such dramatic dark purple poses a challenge. First I tried a blackberry beurre blanc for a salmon filet I’d bought. I’ve adored beurre blanc since I went to cooking school, where I was first introduced to its buttery goodness. A perfect accompaniment to poached fish, if I remember the lesson correctly. Beurre blanc is a rich, delicate sauce that requires a good amount of attention to keep the heat just warm enough, and the butter cold enough, so that the emulsion doesn’t break into an oily mess. 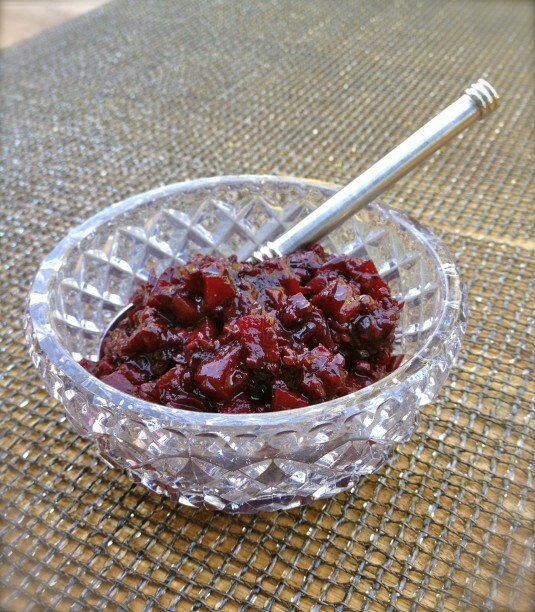 I thought that adding blackberries would add a seasonal punch of summer, an interesting twist to a traditional sauce. The flavor came through wonderfully. Packed with intense berry flavor, and enough tartness from the vinegar to balance with all the rich butter. When I closed my eyes and tasted, all was good. But when I looked down at the plate to see the shocking dark purple sauce next to my pale spring salmon — white spring, no less — I was a little horrified.